Moving image: 4 minute loop as video projection. The Armory Show, New York, 2002. Frederieke Taylor Gallery, New York, 2001. 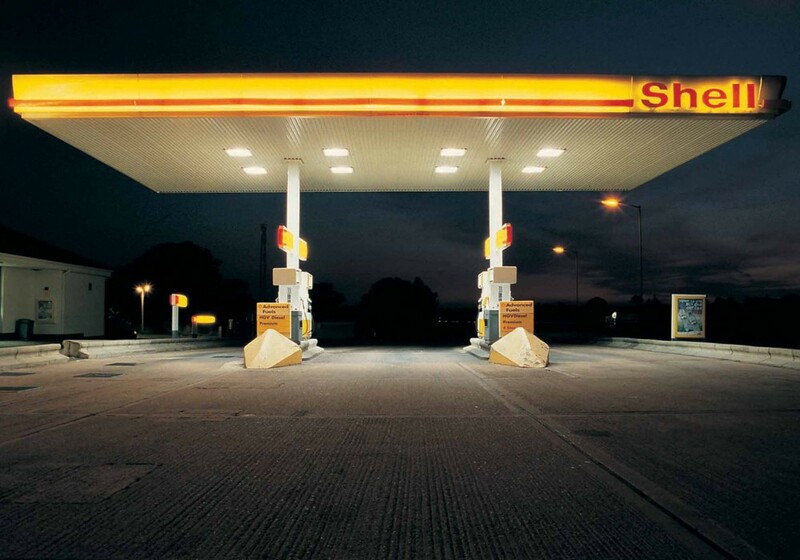 We are interested in the moments and the places that we pass by and through on our way to somewhere else, our experience of stopping at a petrol station, driving on motorways and using service areas. These transient and introverted environments seem to be edited out of our consciousness. We are documenting, surveying and recording these moments and places. They have become our destinations. Memories of a journey at night shows an image of a diesel canopy at night from a fixed viewpoint and projected large scale. All the vehicles passing through the canopy have been edited out at the time of filming and the only movement visible is of the cars and lorries on the motorway. This movement has been slowed down to achieve a quality of suspension and stillness. The stillness and the silence of the imagery draws the viewer into the space and allows them to experience the diesel canopy as a destination.